I suppose I was a bit “in the dark” about frozen cycles. As soon as I knew for sure that we were doing a freeze all, I typed “how long does a frozen embryo transfer cycle take?” What I found, not surprisingly, is that it depends. Like everything else in the world of fertility, there is really no exact answer. The thing that is clear, is that it is longer than I originally thought. I am trying to be patient, but the waiting… the waiting… the waaiiiiting. You all understand the waiting. Here is a partial timeline of my cycle, which obviously does not yet include a date for transfer. However, one of my nurses told me that it is usually about 2 and a half weeks after starting the Estrace. This puts my transfer somewhere around Feb. 2 or 3. 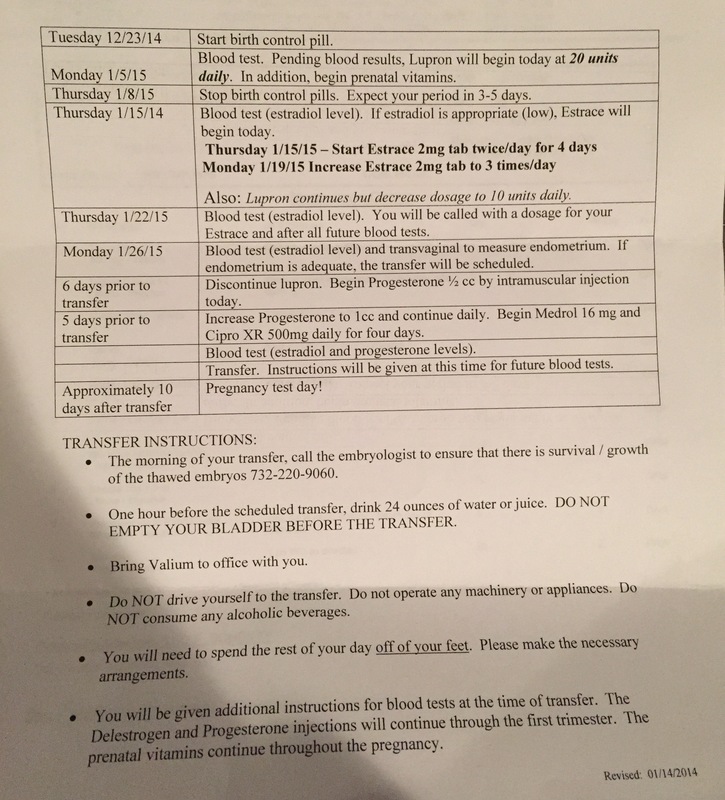 Of course, this is provided all bloods and ultrasounds cooperate with this timeline. I’m always afraid to take anything for granted with this process, but I am excited that the new year will provide me with a new chance. The original frozen embryo from last cycle is Elsa. Working on the other 6. 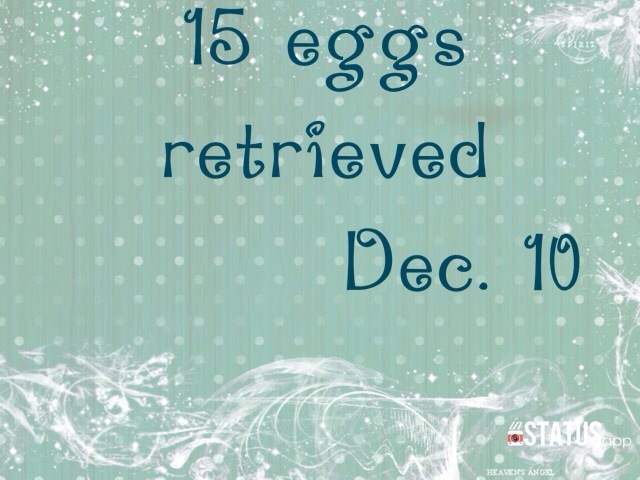 ALL 15 eggs fertilized!!!!!!!!!! My jaw just about dropped to my knees when my doctor called with this news. – We are definitely doing a freeze all. – I can relax and enjoy the holidays without being in a TWW. – Whichever embryos make it to blast by Monday will be frozen as 5 day blastocysts. 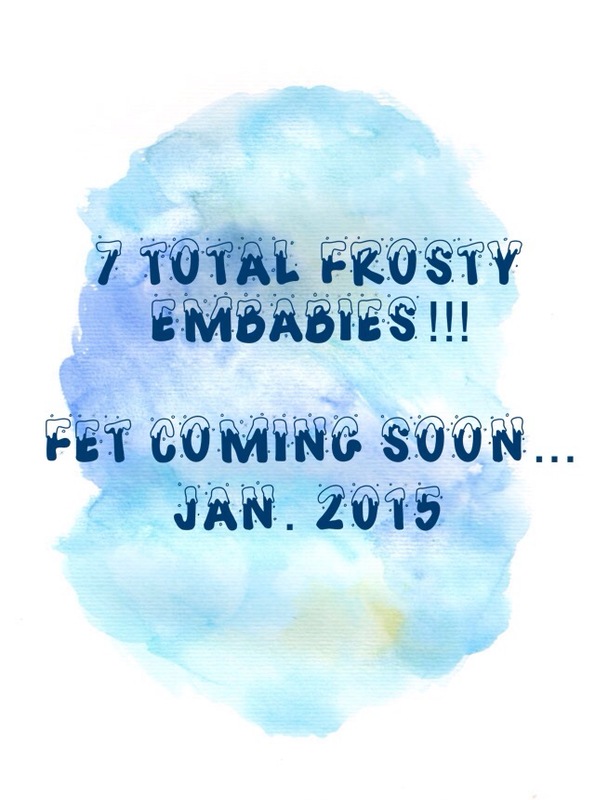 – Whichever embryos make it to blast by Tuesday will be frozen as 6 day blastocysts. – Any embryos that have not made it to blast by Tuesday will not be frozen. – Including Elsa, my frozen blast from last cycle, I am currently pregnant with 16 embabies, outside of my body. – My husband’s response, after a brief happy dance, “We can cast the Von Trapp family children… AND their understudies.” This made me LMAO. – Lab will call Tuesday with a summary report, and until then, I will continue to visualize our healthy and strong embryos!!! Thanks for ALL of your positive thoughts and prayers. I believe in the power of positive thinking. It’s working!!! Home from retrieval! The staff at the surgical location is getting to know me quite well. LOL. I was thrilled that my main doctor was there and by a series of circumstances, is the doctor who ended up doing the procedure even though I wasn’t scheduled with him. 3 tries for the IV is becoming pretty standard and we ended up in the back of my hand. I had a very pleasant drift off and wake up from anesthesia today. 🙂 And you know what made it even more pleasant? 15 eggs in the nest. I am thrilled with this result. This is more than twice what was retrieved last cycle. Of course, I am now anxiously awaiting tomorrow’s fertilization report. On day 3 we should know if we are doing a fresh or freeze all cycle. Right now, I am to proceed as though we are doing a fresh. However, my doctor is pushing for a freeze because he has concerns about hyperstimulation. If enough embryos look strong on day 3, we will convert to frozen transfer in January. In my lifetime I have been blessed to know many genuinely good hearted people who make me want to be a better person. 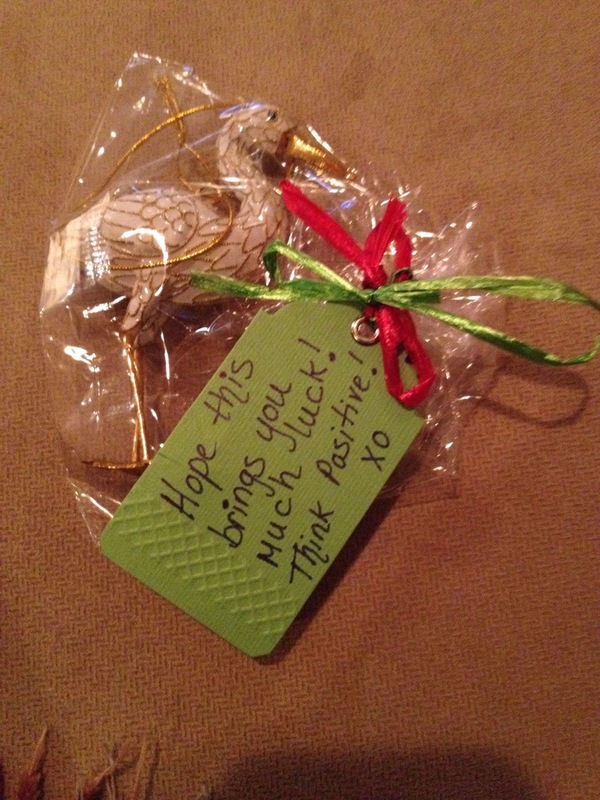 I am a Jazzercise instructor and this is from one of my customers. Words really just can not describe how touched I was by this small gesture, and immediately upon removing the wrapping, the waterworks began. Perhaps it was the hormones. I am in the nurse’s off and she is reviewing my paperwork for tomorrow’s retrieval. Nurse Tina: (looking at something on computer screen) You’re doing a freeze all? Me: Oh… I don’t know. Not that I know of. Nurse: Oh, ok, they will talk to you about that tomorrow. Nurse: Looks like you have a nice number of follicles! Me: (in my infinite optimism, laughing nervously) Yes, let’s hope they are not psyching us out! I am now in my office at school. I open the specimen collection cup bag to make are the cup is right side up before putting it in the fridge. Lo and behold… There is no pink liquid at the bottom and it does not need to be refrigerated. We’ve been doing IUI and IVF for almost a year now and we’ve never had a cup that didn’t need to be refrigerated. OMG I am such a nervous Nelly! Did she give me the wrong cup? Should I call? AM I FREAKING OUT FOR NOTHING?!? I looking forward to the retrieval and ensuing fertilization report so I can sort of take a breath…!!! Maybe. This morning I was so tired during my ultrasound that I barely counted or kept track of anything. 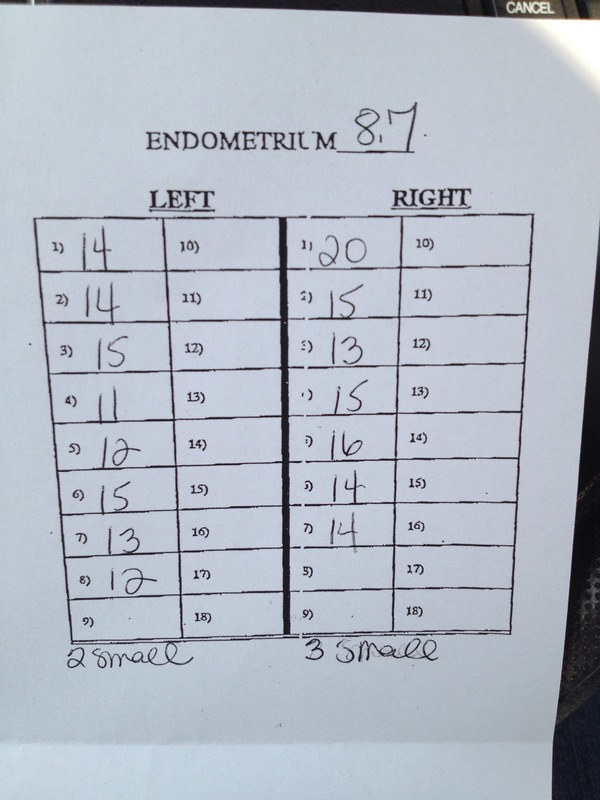 Uterine lining was 9.6, and my front runner grew to 21mm. Other than that, I remember a couple of 18s, but the others are mostly sitting in the 12-15 range. Doc said I was on the cusp of triggering and he wouldn’t be sure until my bloodwork came back. – Will my eggs be mature enough by Wednesday? – Are they rushing it because the lab is closing for the holiday season and I am one of their last retrievals of the year? some of my injections just air, as last night’s almost was? (Don’t ask). – HGH is way too expensive to have missed any doses. – Why didn’t I pay more attention to the numbers this morning? – Why didn’t I check my syringes more closely before injecting. I’m sure I must have messed up something. – If I had 12 measuring follicles last cycle, and retrieved 6 eggs… can I make a soft prediction that this one will yield 8 or 9? Tonight I do one last push on the follicles with 25 units of HGH between 6-9 pm. Trigger 10,000 Pregnyl at 10 pm. Tomorrow morning monitoring (bloodwork only) and retrieval instructions. Come on, maybe-eggs! Get nice and strong! Saw the tech today and not the doctor, since it is Sunday. Doc will call me later with official orders, but tech thinks they will want to stim me one more night. If that’s the case, I will trigger tomorrow and lay my eggs on Wednesday! Last night, I did my injections, with shaky hands, over an open toilet bowl, in the bathroom of a New York City steakhouse. My follicles survived to tell the tale. Once upon a time, during an IUI cycle, I had to give myself a trigger shot in the dressing room during rehearsal for a play I was in. Then of course there was the night of the Billy Joel concert when R had to give me my PIO shot in a restaurant bathroom. Other than that, I have managed to be home for all of my injections… until last night. Last night was the first time I had to stim away from home and boy-oh-boy did I have anxiety over it. We had to leave at 2:15 in order to make our train, and we wouldn’t be returning until well after midnight, so I knew I had to pack plenty of ice packs. I quadruple checked that I packed everything I needed in my insulated lunch bag, and we were off to the city. 7 pm came quickly, in spite of the fact that I couldn’t have any adult beverages, and I headed upstairs to the bathroom, meds in tow. No one in the bathroom. Phew. I chose one of two stalls and clicked the lock behind me. I took my linen napkin and lined the tank of the toilet with it. The remnants of lemon herb vinaigrette have to be cleaner than that tank, right?!? So now picture me facing the toilet, hovering over the open bowl with thousands of dollars of supplies in hand. Out came the Tupperware of meds, out came the Follistim pen case, out came the countless needles. I was so careful, and THANK GOD nothing fell in other than one safety cap, but when I think back on it, it could have been disastrous! Of course, as soon as I started to prep, there was suddenly a long line if women waiting for the bathroom. Ok, Follistim and Menopur injection – check! HGH injection – check! Lupron injection – check! I cleaned up, capped all needles for my sharps container at home, repacked, and finally exited the bathroom. That was step 1. I still had to get into Madison Square Garden. When I got to the front of the security line, I had my bag open. “Medications.” I said as the guard shoved his dirty flashlight in and around. “Uh-huh.” He didn’t believe me, but he let me through. Oddly enough, they gave my father in law a more difficult time about the umbrella he was carrying! I held the bag firmly between my feet during the concert and train ride home and breathed a sigh of relief as I popped everything back into the fridge just before 1 AM. But I can’t remember the left ovary for the life of me. Mostly 11s, 12s, and 13s. R came in with me and said he counted 15 or 16 total. Meds stay exactly the same tonight (225 Follistim, 75 Menopur, 25 HGH, 5 Lupron). Doc predicts retrieval for Tuesday or Wednesday. We are getting there!!! I think I counted 21-ish follicles this morning (day 6) at my ultrasound. Of those, 11 were measurable (ranging from 9-15). Lining 6.5 (which is much less than last cycle at this time, but I know not to compare…) Doc seems happy with this and I go in again on Saturday morning. — I was NOT shown how to mix the omnitrope, nor was I given any resources to help. This is very atypical of my doctors. Basically, I made it up as I went along and prayed for the best. (You know you’re an IVF veteran when you can just “wing” a new injectable). — I am loving my acupuncturist. She is half an hour away but it is worth the trip. Hormone headaches are minimal at this point. This was not my experience with my former acupuncturist and I’m so glad my mom passed this name along to me from a friend of hers. — I am going to see James Taylor at MSG tomorrow night and I have to “schlep” my meds in a lunch bag surrounded by ice packs. I am freaking out about this a little. I think I am going to call the venue tomorrow and make sure they will let me in with my bag of needles. The things we do!